walking around chicago I asw this shot in an alley and snaped it with out thinking about the challenge on the "L" ride home I was reviewing my photos and I gave this one a shot. its the first of my photos to be taken in raw. all I did in PS was a Channle mixer and some contrast. i never saw this 1 man. nor did i know you submitted to this challenge. lol. anyway i like it with the more contrasty B&W tone, they work well for it. but the other side of the ally is a bugger its kinda distracting and if possible i think you should've framed it out using an angled/slantted framing. would've also made the shot more dynamic. 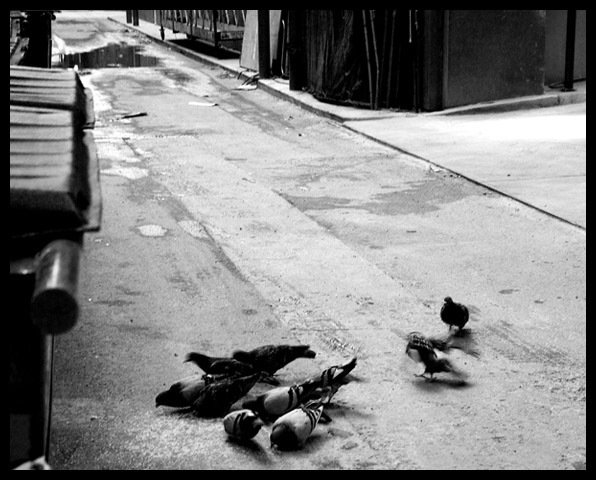 B&W is effective for this shot, but it probably could be improved with DOF to make the pigeons sharp and the background blurred for less distraction as my eye is drawn to the sharpness there that is lacking in the foreground. this has quite a dramatic feeling, i think b&w adds to it. nice composition, 7. Your photo gives me gritty, inner-city feel. really love the feel of this shot. great! nicely composed, nice b&w treatment. Proudly hosted by Sargasso Networks. Current Server Time: 04/22/2019 11:58:15 AM EDT.